Team effort Michael Saxby (third from left) was revived after cardiac arrest by paramedics and an athletic trainer during a game at West Allis Central Dec. 27. A Waunakee JV basketball player will receive a warm reception today when he is released from Children’s Hospital of Wisconsin in Wauwatosa. Michael Saxby, 16, was competing in a game Dec. 27 at West Allis Central High School when he suffered sudden cardiac arrest, according to a press release from Children’s Hospital of Wisconsin in Wauwatosa. Athletic trainer Scott Barthlama performed CPR on the Waunakee player until paramedics arrived. They then performed CPR and used an automated external defibrillator (AED) to keep Saxby’s heart pumping. Saxby was transported to the hospital, where he was diagnosed with a genetic heart condition called hypertrophic cardiomyopathy, according to the press release. It is a disease that causes a portion of the heart muscle to be enlarged and is the leading cause of death in young athletes. AEDs are placed in West Allis Central High School through Project ADAM, a Children’s Hospital of Wisconsin project. It has saved more than 100 lives nationwide, according to the release. 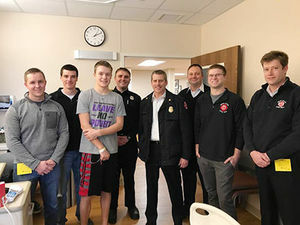 Saxby was greeted by members of the West Allis Fire Department, West Allis Mayor, Waunakee School officials and medical staff upon his release from the hospital.